Claude Fischer, professor of sociology at UC Berkeley, links IRB restrictions with the death of The Statistical Abstract of the United States and fears that they and other trends "combine to increasingly blind policymakers and the public to what is going on in America." Social research has been boxed in from another angle by what many scholars consider a too-obsessive concern about privacy. For example, my colleagues and I found that it extremely difficult if not impossible to obtain decades-old information about neighborhoods – for example, the proportion of the workers living in a particular census tract in 1960 who held professional jobs. The fear, baked into U.S. Census rules, is that with enough such general data we might be able to identify a particular person in a census report 50 years ago and find out, say, how much money he made. 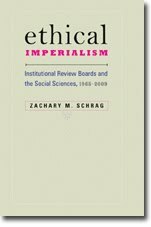 Readers of Ethical Imperialism will know that in 1972 Berkeley's IRB chair, Bernard Diamond, did indeed announce his intention to screen research that could threaten the reputations of social groups. Faculty protested this infringement on academic freedom, and the university reversed this policy in the spring of 1973. Fischer suspects that today's "restrictions on social science may also reflect yet another attitude held by some, both left and right: the conviction that there is no need to gather the data, because they already know the answers." Indeed, IRB regulations and procedures do make more sense if you believe that social science plays an unimportant role in a democracy.